This custom Charles Goodman on Bradley Boulevard in Bethesda’s Bradley Hills Grove neighborhood was the subject of my first posting in October 2006. At that time, it was on the market for a cool $1.6 million. I remember meeting the owners at an open house. 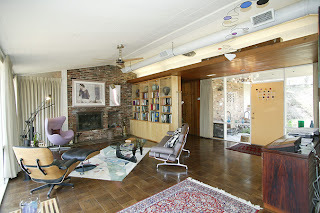 The wife told me how they had a designer help them embrace the mid-century vibe of the home by furnishing the cool living room with classic MCM pieces–a Noguchi table, Eames lounge chair, Jacobsen Egg chair, etc. However, the time had come to sell. They were looking to enjoy their retirement years in a home they had already purchased in Portugal. After sitting on the market for some time, the home was reduced to $1.415 million. Now its listed at just under $1.3 million. The home, known as the Alvin Q. Ehrlich House, is a one-level 4/3 with more than 3,000 square feet. I know the owners did a lot of updating in the kitchen, but when I saw the house the bathrooms and rooms had not been updated. Looks like they may have done some bathroom updates since then. The house does have a nice courtyard with a pool. Click on the listing’s Virtual Tour button for good images. If the price continues to drop (and drop some more), I may have to buy this one for myself.